Parc y Scarlets will present the UK's hottest FMX athletes in an action packed airborne battle to decide who can pull the best trick, the biggest air, the sickest whip or even the nastiest crash! The finest freestyle motocross riders in Europe will be showing off their gravity defying skills featuring the UK's best freestyle riders including Chris Birch - X-fighters pilot and current British Champion; Jamie Squibb - former Big Air Jam Champion; John Pearson - first rider in the UK to pull the back flip on a motocross bike; Danny Veale, Stuart Macey, Ben Robinson and Jon Ritchie. 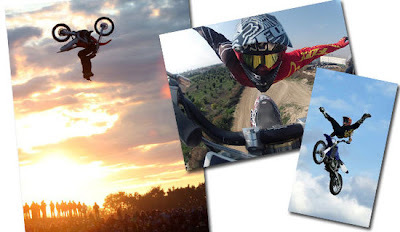 Come rain or sunshine on Wednesday 6th June, Parc y Scarlets' under-cover seating will offer the best possible arena to watch the thrill of athletes jumping 40 feet in the air pulling acrobatic stunts over gaps approaching 100 feet, whilst on a motorbike! Tickets are available by calling 0871 871 8088 or go online www.scarlets.co.uk. EVENT DAY prices: £12 adults, £7 juniors, £33 family. If you'd like to get closer to the action make sure you're at the Pit Party in the Big Air Jam Village (within Parc y Scarlets' West Stand) where you can get live and breathe the sights, smells and adrenaline aswell as having special backstage access to meet some of the riders! Pit Party wristbands priced at £1 per person.